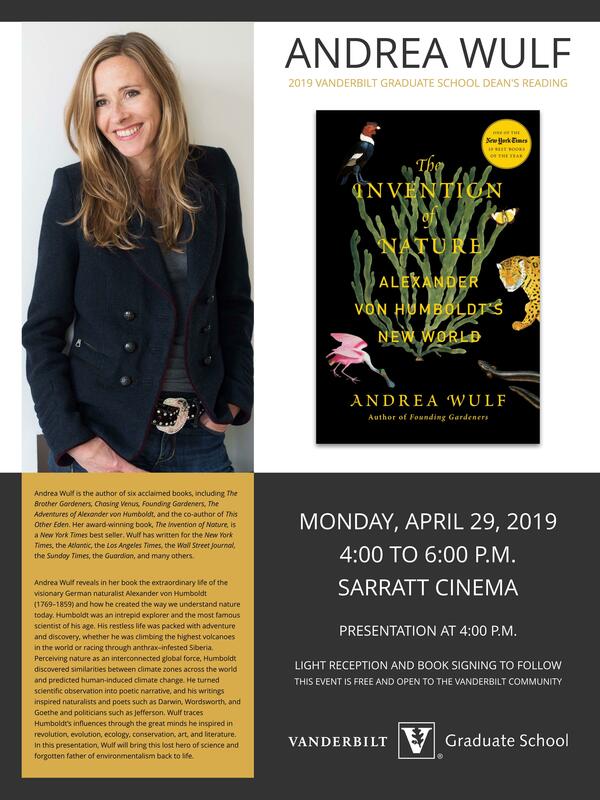 Author Andrea Wulf will speak at Vanderbilt about her book, The Invention of Nature, on Monday, April 29, at 4:00 P.M. in Sarratt Cinema. In her book, Wulf reveals the extraordinary life of the visionary German naturalist Alexander von Humboldt (1769-1859) and how he created the way we understand nature today. He turned scientific observation into poetic narrative, and his writings inspired naturalists and poets such as Darwin, Wordsworth and Goethe but also politicians such as Jefferson. As she walks you through his wondrous travels, Wulf brings this lost hero of science and forgotten father of environmentalism back to life in this beautifully illustrated lecture. Books will be available for sale in the lobby. This event is open to the entire Vanderbilt community. RSVP recommended. Presentation begins at 4:00 PM, and the lecture will be followed by a light reception and book signing.